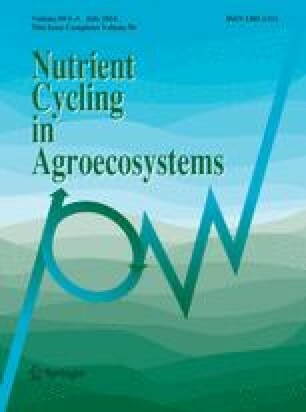 Long-term effects of fresh (FM) versus composted (CM) beef manure application to barley (Hordeum vulgare L.) on potentially mineralizable nitrogen (N 0 ), and mineralizable nitrogen (N) pools, were evaluated in a clay loam soil in southern Alberta, Canada. A suite of laboratory-based indices were evaluated for prediction of soil N supply. The treatments were three rates (13, 39, 77 Mg ha−1 dry wt.) of FM or CM containing either straw or wood-chip bedding, 100 kg N ha−1 as inorganic fertilizer, and an unfertilized control. Treatments were fall-applied annually for 8 years (1998–2005). Soil samples (top 15 cm) were collected in spring 2006. The medium and high rates of organic amendment resulted in increases in N 0 , and readily (Pool I) and intermediate (Pool II) mineralizable N pools in ranges of 140–355 % compared with the average of the fertilizer and control treatments. Fertilizer application had no significant effect on mineralizable N pools, but increased the mineralization rate constant (k) compared with the control. Application of FM and use of straw bedding resulted in a greater quantity of readily available and intermediate mineralizable N, and also increased the rate of N turn-over as indicated by greater values of k, compared with CM and wood-chip bedding. Among laboratory-based measures of soil N supply, CaCl2–NO3 (r2 = 0.84) and NaHCO3-205 (r 2 = 0.79) were strong predictors of plant N uptake (PNU). Increased soil mineralizable N did not translate into greater barley dry-matter yield or PNU. Composted beef manure and use of wood-chip bedding can be recommended as alternatives to FM and use of straw bedding for barley production is Southern Alberta. Funding was provided by the GAPS and AGGP programs of Agriculture and Agri-Food Canada. Technical assistance was provided by B. Beasley, G. Decker, D. Janes, and K. Terry. Help provided by Dr. Ravinder Pannu and Dr. Mohammad Reza Ardakani in arranging the data and editing the manuscript is greatly appreciated.